Why Doesn’t God Punish Evil? Life wasn’t fair for Mattie Ellen. Her husband died, leaving her with four children and nothing else. In those days in the early 1900’s no high-paying jobs were available for women. Mattie Ellen did housecleaning, mending and other odd jobs. Still her little family was dirt poor. They didn’t know what a good square meal is. Then one day Mattie Ellen and her children got a job picking strawberries. It didn’t pay a lot, but Mattie Ellen saved every spare penny. Finally she could buy a few new clothes and badly needed shoes for her children. Soon afterward, a traveling salesman passed by with a catalog full of wonderful things. Mattie Ellen looked through the catalog and carefully chose a few things for each child. Then the long wait began. Every day the family watched the mailbox, waiting for the magic day when their precious clothing would arrive. New clothes at long last! How they needed them! The weeks dragged on into months, but the package never arrived. Finally Mattie Ellen had to tell her four waiting children that the package would never come. They had been cheated. A poor woman like Mattie Ellen could do nothing to get her money back. The scoundrel continued to travel from place to place, cheating people everywhere he went. As far as Mattie Ellen knew, the salesman was never brought to justice. “It’s not fair!” we cry out. “Why didn’t someone stop that man?” Yet we know that life is often unfair. Every day evil people work out their schemes on innocent people and get away with it (for now, anyway). Why doesn’t God put a stop to it all? We know these people will get their due in eternity, but what about now? Why doesn’t God punish evil—promptly, consistently and completely? God in His omnipotence could snap His fingers and put the world in order. Yet while Christians yearn for God to “make it all right,” God often restrains His power in the interest of free will. Free will is a mysterious concept that stumps even the theologians. God chose out a people to believe on Him before the foundation of the world. Yet they choose to believe by an act of their wills. Impossible as it seems to reconcile the two concepts to human minds, it makes perfect sense to God. God has so ordered life that a person can take God or reject Him. Without free will, our love means nothing to God. Love that is forced, bribed or manipulated into existence is not real love. What if God dealt with people fairly, the way we see fairness with our human minds? 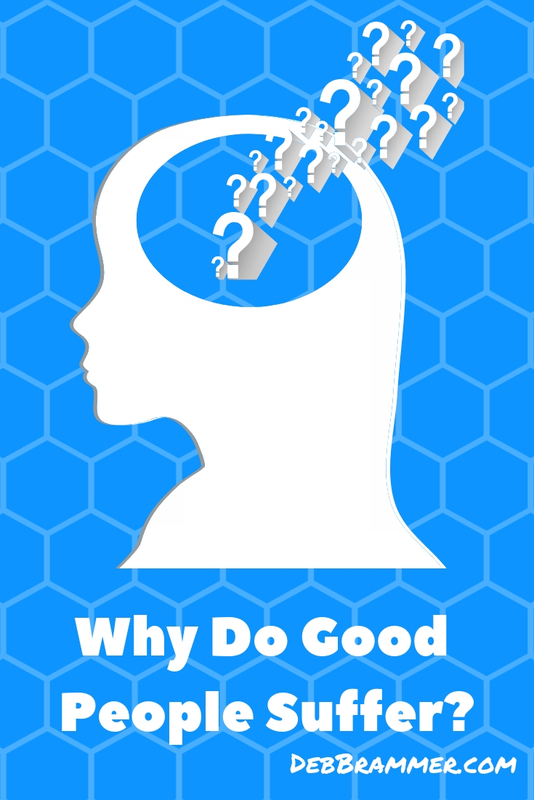 What if God immediately and consistently rewarded every good, noble act and punished every mean, sinful act? People would serve and obey Him, not out of love but out of simple selfishness. God does reward and punish, but it is not always obvious to us on a day-to-day basis. This way, many ignore God or openly reject Him. But others desire to love Him completely, even when they don’t understand the things that happen to them. And that is exactly what God is after. That kind of love fills God’s mighty heart with joy. The opposite is also true. When God’s children turn from Him despite His faithfulness and goodness, He is grieved. When sinners refuse His gift of salvation, paid for at such a cost, it cuts Him deeply. Read the Old Testament from God’s point of view, and you can witness the pain He felt. For centuries God showered rich blessings upon His precious people, the nation of Israel. He promised to continue to bless them if they would only be faithful to Him. And He promised just as sure punishment if they turned to other gods. In spite of the warning, the Jews consistently, repeatedly ran after other gods. Yet as we scan the pages of His Word, we sense God’s dragging His feet in His dealings with them. The rod of punishment moved very slowly in His hand. God never compromised His holiness, but His slowness to act gives us a glimpse of His patience and His yearning for His children to turn back to Him. The nation of Israel knew well the benefits of God’s mercy and patience in dealing with them. Yet those beneficiaries of God’s patience could not understand when God turned that patience toward their enemies. God had promised to destroy Israel’s enemy, Assyria. But the prophet Nahum must have wondered, “What is taking God so long?” Assyria was at the height of its power and constantly fighting wars with Israel and other nearby countries. The Assyrians took pride in their atrocities. They tore off the limbs of their victims, skinned them alive, boiled them in tar, put out their eyes and beheaded them. They erected pyramids of human heads as monuments to their greatness. Next to them Hitler was a wimp. More than a century earlier, God had promised to destroy the Assyrian capital of Nineveh. But before He did, He forced Jonah to warn them of their doom. Nineveh repented, and, just as Jonah had feared, God had the audacity to forgive them and save the city. Nineveh’s revival, however, was short lived. By the time Nahum prophesied, the Assyrians were more wicked and ruthless than ever. God still hadn’t kept His promise. Nahum and his people were getting a bitter taste of God’s patience. Then came the good news. God was finally going to destroy Nineveh. Though it looked as if the Assyrians had been getting away with their cruelty for more than 100 years, their end was near. Nahum wrote verse after verse about God’s wrath, yet this one stands out: “The Lord is slow to anger, and great in power, and will not at all acquit the wicked” (Nah. 1:3). The Jews wouldn’t miss Nineveh any more than Jews in this century miss Hitler. God told Nahum the Jews would “clap their hands” when Nineveh fell. But we don’t read of God gloating over Nineveh, glad to see them get what they deserved. God didn’t rejoice at seeing Assyria suffer. If God, whose spotless holiness is offended by every sin, can be extremely patient and loving with sinful men, we would do well to still some of our cries for justice. God waited patiently for us to come to Him. Dare we complain when He holds out His mercy to others? It is not easy to stand by and watch evil men prey on the innocent and prosper because of it. Even King David struggled with that frustration in his day. In Psalm 37, however, we see David realizing how short the days of evil men are before certain destruction. In the meantime he counseled righteous men to “cease from anger, and forsake wrath.” Anger leads only to evil. How Should Believers Respond to Injustice? Sometimes Christians have to stand up to injustice and demand that things be put right. Most of the time, however, such things are beyond our control. Then we have to stare injustice in the face with peace in our hearts. When we are treated unfairly and can do nothing about it, we have to let go of our hurt, forgive the person and go on. Is that possible? I know it is. Mattie Ellen’s little boy grew up. He knew poverty. He met grief when his mother died when he was eight. He witnessed plenty of unfairness and was taught to respond by getting even. Then one day he met the Master and learned to forgive. When he had children of his own, he taught them to let go of anger and wait for God to repay evil. And that’s why I know this truth. I am his daughter. Pastor Ray Allen is now in heaven. In my next blog I deal with this question: Is God in control? 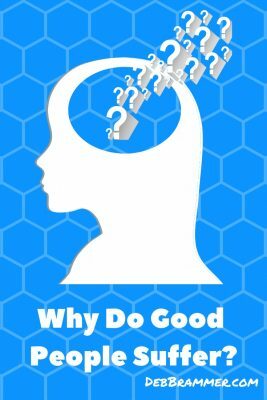 Why do good people suffer? Why doesn’t God punish evil? Is God in control? Part of ministry is answering honest questions like these. In the next few blogs I’ll talk about these tough questions. I don’t claim to have all the answers, but I trust these articles will be helpful in your ministry. Crib death. An ugly term. To Diane (based on a true story) it meant her beautiful baby girl was suddenly, inexplicably gone. While the pain of loss still tore at her heart, Diane received another death sentence: multiple sclerosis. This time she herself was the victim. The doctor’s diagnosis meant that she would not see her toddler Sara graduate from high school maybe not even from grade school. Someday when Sara’s friends were still hanging on monkey bars, Sara would be cooking, doing laundry and pushing her mother’s slumped form back into her wheelchair. Then, in the midst of the disaster of diagnosis and loss came joy. A new baby girl. For a while the joy of the new arrival helped ease the pain of the former loss. But one day while Diane was bathing her precious infant, she blacked out. When she came to, she found her baby had drowned. Why? That’s what we want to know when tragedy strikes fine Christian people such as Diane. Why does God allow good people to suffer? Most of us can’t claim two dead babies and a debilitating disease, but when tragedy hits us we still ask why. We don’t expect life to be easy. Everyone experiences hardship. But when we get more than our “fair share” of it, we begin to doubt God. We must believe that God is in control of our circumstances. Nothing comes to us that He doesn’t allow. That reassurance can be comforting. Or it can shake our faith. When our pain is most intense, we know that God is standing by with His hands in His pockets watching His children suffer. An unbeliever may accept tragedy as part of life, while a Christian knows God allowed it on purpose. He struggles with not only the hardship but also the reason behind it. What did I do to deserve this? Did I unknowingly do some awful thing, and God is punishing me for it? Is God trying to teach me a lesson, and I’m not learning it fast enough? Like a doctor ticking off diseases that could cause a set of symptoms, we try to make our tragedy make sense. We can guess at the whys, but most of the time we end up with more questions than answers. The questions can shake our faith. At the bottom of quivering faith lie not only questions but also myths. Some Christians expect these myths to be true, but they aren’t. Myth #1: Christians shouldn’t have big problems. We don’t expect the Christian life to be easy. We know we’ll face opposition from a hostile world. But with Almighty God on our side, we expect many of our problems to disappear. It starts with little things. We learn to pray about finding a parking place or money for a new pair of shoes. Many times God does help us through these everyday problems. Therefore, we expect God to work out all our inconveniences and make life smooth. Then when God makes us sweat out the same everyday frustrations that unbelievers face, we doubt His love. God never promises us a sort of “charmed” life where the solution to all life’s problems is miracles. If we think so, we have forgotten Joseph, Job, the Apostle Paul, Hosea, Jeremiah, Stephen and a host of others in the Bible for whom life often did not make sense. God does promise a good life without tears—but not until eternity. Until then, Christians have to fight out life’s hardships and unfairness along with unbelievers. And why not? We can take suffering better because we have God’s enabling and guidance from Scripture to help us. Unbelievers suffer with no purpose, but we know God has purpose even in suffering. Myth #2: God is out to get us. Yes, God sometimes sends suffering as discipline to bring us back to Him. He allows hardship to teach us things. But He is the same God Who created thousands of kinds of butterflies, flowers and tropical fish. He is not the no-nonsense, wet blanket kind of God we take Him to be. He brings beauty and opportunities for laughter and fun into our lives every day. Most often, however, we’re too busy to notice. God never rejoices that we suffer. He feels our pain. No doubt it would be far easier for God to step into our lives and do all the hard things for us. But like a wise parent who watches his child striking out at baseball, He does not always intervene. God allows us to learn and to grow up. Myth #3: Someday God will explain everything, and it will all make sense. Many times I have heard people say that when we get to Heaven, God will sit down with us and explain the reason for all the bad things in our lives. I picture God going down an itemized list and explaining His reason for each unpleasant event in my life. But as I search the Bible, I find no such promise. God is under no obligation to explain anything, much less everything, to us. My guess is that the whys of life won’t matter much then. And if they did, God’s wisdom is so immeasurably higher than mine that I would probably understand few of His explanations. But I can understand this concept: God loves me more than I can possibly imagine. If He did nothing else for me, Calvary would be proof of that. Yet Calvary is only a beginning. Every day He supplies every need I have. The whole world is full of evidence of God’s goodness and love. But since Christ died for everyone and many of His blessings are also universal, it’s easy to think these blessings don’t count. We begin to think God owes us an easy life besides. We will never be happy, however, until we trust God’s wisdom in ordering our lives. Myth #4: Suffering is always the means to another end, not the main point. The apostles thought suffering was a privilege. After they had been beaten (see Acts 5), they rejoiced that God had counted them worthy to suffer for Christ’s sake. The early Christian martyrs were so thankful for Christ’s death for them that they welcomed the chance to suffer for Christ as the means of expressing their love for Him. But they suffered because of their stand for Christ. They will get a rich reward in Heaven for their suffering. What about the suffering that makes no sense? Job lost everything in a seemingly senseless string of tragedies. His friends were not impressed by his faith. Job had no idea his suffering would span the centuries and inspire people of all ages. Nothing made sense to him. Yet Job said, “Though he [God] slay me, yet will I trust in him” (Job. 13:15). Job’s faith when he had cause to doubt pleased God. He recorded the whole story in Scripture. We don’t read of Job preaching, doing miracles, organizing revivals or serving on committees. All Job did was trust. That was enough to make him a giant of the faith. And what does that mean to us? It means that our response to difficulties, both large and small, counts. Our trust in God in difficult circumstances sends a powerful message to a hurting world. It reaffirms the faith of other believers. But even if no one else sees our suffering or response, our faith matters to God. Nothing else pleases God quite so much as our unreserved trust in Him when we can see every reason to doubt. My next blog talks about this question: Why doesn’t God punish evil? The box of chocolate is trouble. Given to me by a thoughtful friend, it sits on the counter calling to me. I know it won’t help me lose weight. It contains ingredients that cause me to itch, but not really get sick. One little piece of chocolate today isn’t going to make much difference in my body. And that’s the problem. If chocolate candy was forbidden, if it would really cause me harm, I wouldn’t be tempted to eat it. My husband isn’t tempted to eat these chocolates because they contain gluten which can make him really sick and cause his body lasting harm. But one piece won’t hurt me. If I had to peel, slice and cook every chocolate I ate, that would slow me down. That would require thought, work, delayed gratification. But the chocolates are sitting on the counter, convenient, a few steps away. If the piece of chocolate that’s staring me in the face right now would make a huge difference in my weight and health, I could certainly resist it. But one little piece, now, won’t make a difference. It’s all the little pieces of chocolate added together that make the difference. So I have a solution. Eat all of the chocolates today and get rid of them so I won’t be tempted by them tomorrow. Laugh if you want, but it’s the path I usually choose. And if another box of chocolates doesn’t appear in our house soon, it works. For chocolate. What, then, about the other foods that call to me? Maybe it’s not about what foods I eat, but how much of them I eat. Or the ratio of chocolate and potato chips that are a quick grab between meals to the more nutritious basic food I eat for meals. Each sugary, more processed, less nutritious food I eat is not a problem on its own. It’s the many tiny choices added together that bring me down. Today is the only day I can make a life change. Yesterday is gone. I might be able to learn from it, but I can’t change it. 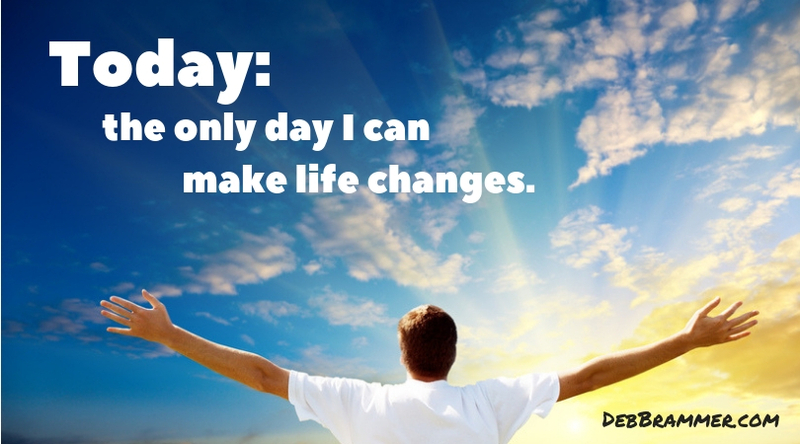 Setting goals and making plans for tomorrow may help me make life changes. They give me a course of action. But if all my plans are always for tomorrow, my life will never change. Change happens today when I think about the piece of chocolate within my reach. The encouraging phone call or email I can begin right now. The sin I need to recognize at this moment and end for good. The disparaging thought I can replace immediately with a better one. The habit I refuse to do one more time. The relationship I need to mend, starting today. Because a whole life is simply a solid line of todays, one after another. If I’m going to get victory over a problem, it needs to begin now, with the choice that is within my reach.